Tigers are mammals which belong to the big cat family. The largest of the big cats, these creatures rely on hunting within a territory for their survival. The more prey there is available, the smaller their territory is. But if food is scarce tigers will claim an ever larger area for hunting. As they hunt, the stripes on their coat help to conceal them in jungle bushes or areas of tall grass. These animals are able to live in hot humid rain forests as well as the cold and snow. Tigers are born with beautiful thick coats, striped orange and black or white and black. At birth these animals weigh only 2 pounds but they grow to 250 pounds as adult females or up to 500 pounds as adult males. Some male Siberian tigers reach 600 pounds as adults and can be 14 feet long. Usually 2 or 3 cubs are born to a female, who raises them on her own. Cubs drink their mother’s milk until they are about 2 months old. At this age the mother begins to bring the cubs meat. At about 5 months old the cubs begin to learn hunting techniques by flushing small prey out of the bush for their mother to catch. Tiger cubs live with their mother until they are about 2 years old. Tigers usually hunt at dawn, dusk, or by night. They ambush and pounce on their prey rather than running it down as a Cheetah would. Tigers eat deer, wild boar, monkeys, and other forest animals. Occasionally they will attack a young rhino or elephant. However, they will also eat or snack between hunts on crabs, fish, turtles, lizards, locusts, frogs, and even fruit. They also sometimes eat grass to help them digest their food much as domesticated cats do. They have even been known to eat mud and it is believed that this may also serve a digestive purpose for these creatures. In the Sunder bans, an area of India and Bangladesh, the approximately 250 tigers which live in this place do seem to target humans as prey. Since tigers sneak up on their prey and generally spring from behind, at one time masks worn on the back of the head tricked the man-eating Sunder ban tigers and prevented attacks on people. These tigers now seem to understand that one side is fake and this method of protection is not as affective as it had been. However, in most cases tigers leave humans alone. Unless a tiger is too old or weak to catch other, faster, less available prey. At the beginning of the 20th century there were approximately 100,000 tigers in the wild. Now there are only about 6,500 tigers left in the world. These tigers can be separated into 5 types; the Bengal tiger, the Indo-Chinese tiger, the Sumatran tiger, the Siberian tiger, and the South China tiger. Man has hunted tigers and encroached upon the tigers territory depleting the tigers’ food source. As tigers find less to eat in the wild they turn to hunting livestock. Farmers often kill tigers which have preyed upon their domesticated animals. But man also hunts the tiger for other reasons. 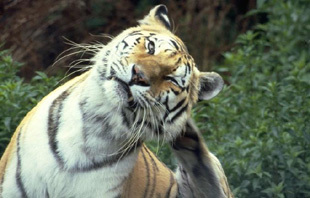 In traditional Chinese medicine most body parts of the tiger are used for cures. Even tigers killed with cars or in other accidents are quickly foraged for their supposed medicinal purposes. Practically every part of the tiger including its brain and whiskers are taken for such beliefs as the whiskers can relieve a toothache. While Bengal tigers are the most numerous with about 4,000 of them left, the Sumatran and Siberian tigers are near extinction with just 500 or so of each living today. The South China tiger is at an even greater risk with only about 40 tigers left. Luckily there are a few tiger reserves now established in their natural habitats for them to live and hopefully gain in number. Many zoos also offer the chance for tigers to reproduce to keep this species from becoming extinct. There are several organizations available for individuals to help and contribute to, which strive to keep the tiger alive and flourishing. Tigers can eat more than 65 pounds of meat in one meal. Only approximately 1 out of every 15 hunts is successful for the tiger. A tiger’s territory can be hundreds of square miles in size. 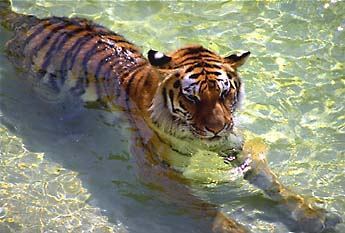 Tigers are good swimmers and, unlike house cats, enjoy bathing in water from time to time. Tigers can leap 33 feet (10 m.) in a single bound. White tigers have a recessive gene which gives them white fur with black stripes, blue eyes, and pink noses and paw pads. There have also been a few tigers with white stripes recorded. White tigers are not considered albinos, which are characterized with pink eyes. 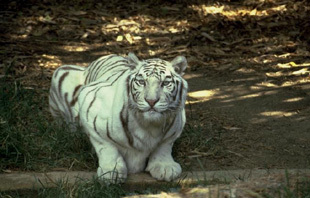 One white tiger on record had white fur with orange stripes. Tiger night vision is 6 times better than human night vision. Each tiger has its own individual stripe pattern. Tigers leave a scent as well as scratchings to mark their territory. 5tigers The Tiger Information Center by Ron Tilson, Ph.D., Janet Tilson and Anne-Marie Alden includes information about the body, behaviors, and habitat of the tiger. It also has a nice photo gallery, a teacher resource section, games, maps, and more. Cyber Tiger by National geographic.com/kids - This site allows you to select a name for a tiger and then set up a zoo habitat for the tiger. Throughout the set up there are fact files available for you to enjoy and learn from. The Realm of India's wild and endangered Bengal Tigers has information about tigers including sound clips, photos, and facts. The Vanishing Tiger by Candice Klarich has information, facts, photos, and more.